I constructed some 28mm Macedonian Prodromoi by adding cloaks and heads from the Victrix "Macedonian Greek and Successor Heavy Cavalry" set to bodies, arms and horses from their Greek Light Cavalry set. I added spears made from plastic brush bristles. I think they work really well. Some Greek Light Cavalry; from the Victrix set of the same name. I did add in a few heads from the spares box. A week ago I bought a copy of "Soldiers of God" by Warwick Kinrade. This is my first solo game with the rules. The rules put these into 3 "battles"
Four 3 stand units of horse archers Two 3 stand units of Ghulums Two 4 stand units of Adath (militia spears) Two 4 stand units of archers One 2 stand unit of Arab Tribal Cavalry Two mounted commanders and one on foot Again in three "battles"
Note the cards, these drive the game. Three cards are allocated to each side to denote their battle plan. These are allocated one per battle and they stay with that battle for the game. We have been playing L'art de la Guerre for a few months now. 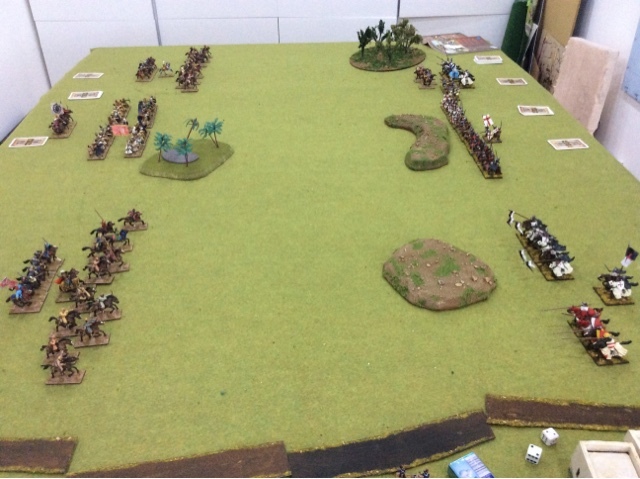 Having played a dozen or more 200 point “line em up and bash hell out of each other” games me and my mate Stuart had a go at a scenario last night. I found a Warmaster Ancients scenario for Dorylaeum (1097) in Battlegames Issue 32 (by Daniel Johnson) and adapted it to the figures that I had. 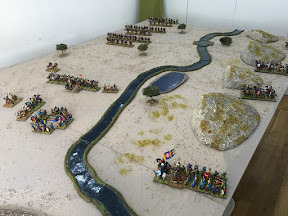 Game was in 28mm Seljuks Vs Crusaders on 8X5 table. The Crusader Vanguard is attacked by a Seljuk horde. The foot are making a camp and then defending it. Other Crusaders are straggling into line. More Crusaders are making their way through difficult terrain (The Turks beleive it impassable). They will appear on the Turkish flank. End result; Phyrric victroy for the Crusaders. (In real battle they won but sustained more casulaties than the Turks). So, pretty close to historical.